More than 95% of Kidpower workshops are coordinated by teachers, social service providers, business owners, scout troop leaders, parents, and so on. These community-based Workshop Organizers give their time and energy to bring a workshop to others in their community. Many arrange workshops year after year! As a direct result of their efforts, people of all ages and abilities learn skills to have safer, more positive experiences with people everywhere they go. 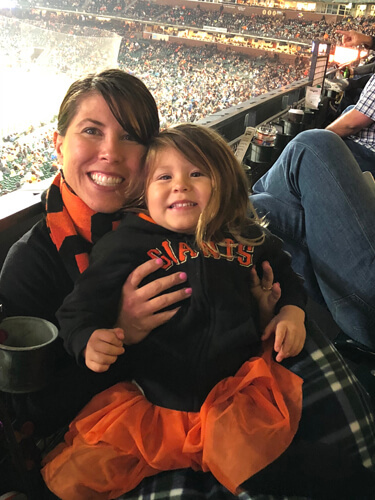 As the Parent and Caregiver Education Manager at Children’s Council of San Francisco, Jessica Boehme-Flores offers educational programming that supports families, caregivers and child care professionals who serve young children. By providing a wide range of workshops and family programing, including Playgroups and a New & Expecting Moms Group, the Children’s Council engages with the community on many levels. The Resource & Referral Agency works to elevate and support interested, new and established child care professionals, while helping San Francisco families access safe and nurturing child care. Jessica is a strong advocate for families and providers caring for both typical children and children with special needs. For the past 5 years, Children’s Council has partnered with Kidpower, to offer learning opportunities for parents and those in the child care field. This successful collaboration supports a safer, happier and healthier community! Hundreds of children and families have learned Kidpower skills to be safer online as well as in physical spaces thanks to The Harker School’s deep and lasting commitment to making interpersonal safety, positive communication, and social emotional skill development a high priority. The Harker School is a private school in Silicon Valley that has earned international recognition for its top academics, quality teachers and student achievements. Founded in 1893 and educating 2,000 students, Harker is the largest independent school of its kind in California, serving families of preschool, elementary, middle and high school-aged children, with each division on its own campus in San Jose. Every year, Harker ensures that each K-8 class has two classroom workshops with their teachers to practice boundary-setting, advocacy, awareness, and other social safety skills that will help the students be safe now and for years to come, in the real world and online. Kidpower has been working with our K-8 students for several years now. They work to make each session appropriate to the needs of our school and of each grade level. Kidpower speaks to students about potential safety risks that could affect them; however, instead of making it sound or feel scary, they empower students to advocate for themselves so that they can become more confident individuals. Kidpower also trains and empowers our teachers to use language that can help their students become confident and self-aware in the midst of even the trickiest of situations. Our students and teachers have benefited so much from their work with Kidpower that Harker recently increased the number and length of sessions we host. Thank you, Harker, for your leadership in putting safety first! Children served by California Children’s services have medical conditions or disabilities that can also cause them to be targets of bullying and abuse more often than their peers. 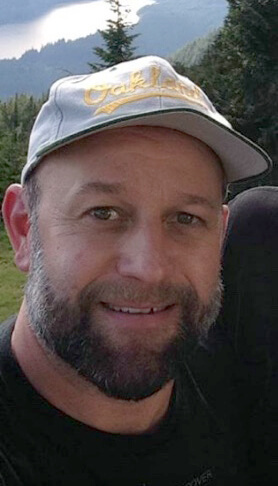 Thanks to Mitch Eckstein, Social Work Supervisor for California Children’s Services San Mateo County, more than 100 of these vulnerable young people and their parents and caregivers have learned Kidpower skills to help them be safe from bullying, abuse, and other violence. In addition, CCS occupational therapists, physical therapists, and social workers have had the opportunity to learn strategies for incorporating Kidpower skills into their standard practices through workshops Mitch has taken the lead in arranging for more than a decade. Mitch experienced Kidpower for the first time in 2007 and saw for himself the difference a few hours can make in the lives of families they serve through California Children’s Services. He was inspired to take the lead in reaching out for more services, and as a result of his efforts, families have had the opportunity to experience Kidpower every year. We are concerned about the prevalence of teasing and bullying, and we are concerned about the effect it has on the kids we work with, children who are often targeted because of their disabilities. Kidpower has provided us and the families we serve with practical tools to address the needs of these kids to empower them so they are safer. We are grateful for Mitch, his colleagues at CCS San Mateo, and their commitment to the health, safety, and well-being of vulnerable children and families! 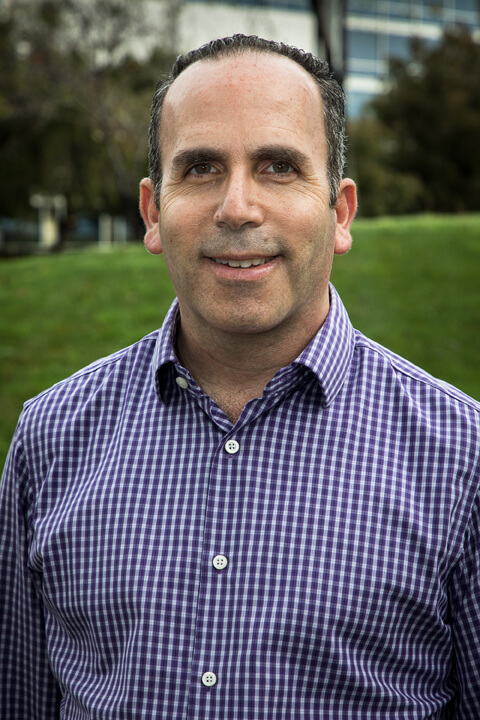 Join us in celebrating The Arc San Francisco – especially Jacy Cohen, Director of Strategic Partnerships, who, in 2018 alone, has organized two fantastically successful Fullpower Workshops serving more than 100 adults with intellectual and developmental disabilities along with professionals and adult family members enthusiastically learning social safety skills together! Jacy knew firsthand that Kidpower’s experiential, upbeat approach makes crucial personal safety information relevant, accessible, and enjoyable to practice – key elements to our effectiveness. And, she also knew that many without Kidpower experience might be skeptical – so she invested lots of time extending personal invitations, answering questions, and helping folks feel welcomed. The responses from Arc clients, family members and staff to our Fullpower trainings has been overwhelmingly positive. Everyone learned new skills to help them and those they care for stay safe, be more confident, speak up, and set boundaries. These workshops are extremely relevant and important for all of us, and the workshop leadership has been excellent! When organizations like The Arc San Francisco – and their dedicated staff like Jacy – take time to learn about Kidpower and then to help make it accessible to others in their communities, Kidpower is able to further our mission of helping people of all ages, abilities, and identities have the skills and information they deserve to take charge of their safety. We are grateful to Jacy and The Arc San Francisco – and look forward to our continued partnership! Tenderloin Safe Passage, a program of the Tenderloin Community Benefit District, is a coalition of mothers, youth, seniors, volunteers, and service providers dedicated to building a culture of safety and respect on the streets of San Francisco’s Tenderloin in order to support the well-being of children, seniors, and everyone living, working in, and walking through the Tenderloin. Safe Passage Corner Captains are the backbone of the Safe Passage program. 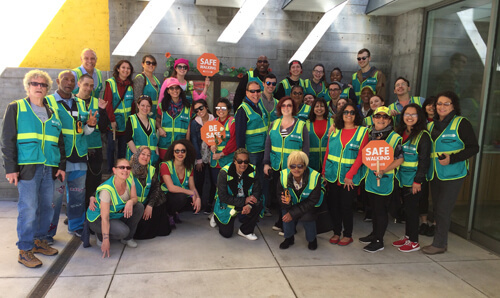 They are volunteer safety ambassadors who monitor high-risk street corners in the Tenderloin during the after-school commute times and in the mornings during ‘Safe Passage Senior’. We are proud to have provided Kidpower Safety Leadership Training for Corner Captains for six years. 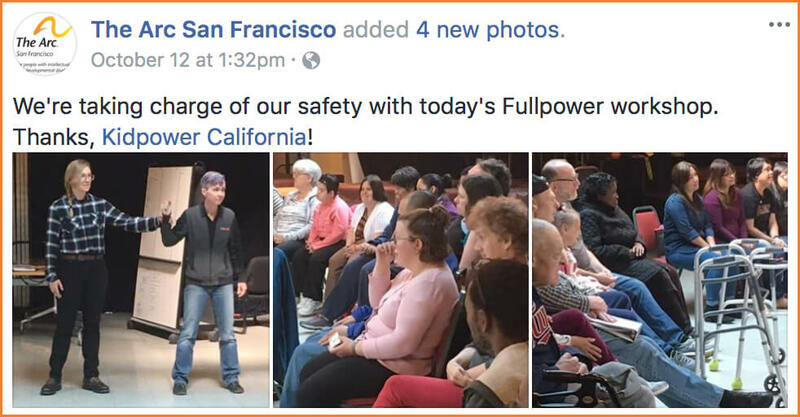 Tenderloin Safe Passage has organized more than 12 Kidpower Safety Leadership workshops serving Corner Captains – and welcoming staff members from youth and senior program partners as well. These workshops focus on skills for projecting awareness and confidence, de-escalation, proactively addressing potential problems before they grow, managing personal triggers in order to think clearly in potentially dangerous situations, and taking action that supports the safety of children. Over 3,500 children live in the Tenderloin, and we are proud of our partnership with Tenderloin Safe Passage as well work together to support their safety each day as well as the reduction of incidents of bullying, violence, and abuse in the Tenderloin! Students with vision loss practice Fullpower skills! For more than 10 years leaders at The Hatlen Center, a program of Junior Blind of America, have ensured that all Hatlen students, young adults with vision loss who are striving to build skills for independent living, have the opportunity to learn Fullpower skills to prevent, avoid, de-escalate, and escape from potentially dangerous situations. We are honored to have the opportunity to serve Hatlen students and staff each year and grateful for the passionate commitment all Hatlen staff have demonstrated over the years to teaching skills that will help young adults with vision loss be safe and thrive! Kathy Marshall, Director of Curriculum and Instruction for the Orinda Union School District, is one of many administrators, teachers, parents, and board members in the district who have invested significant time and effort over the last year to assess safety program options and to launch a Kidpower pilot program district wide. While Kathy is one of many dedicated individuals committed to building a culture of safety and respect – and to taking action to build it – she is the one who works directly with Kidpower coordinators to plan, schedule, and organize logistics to support the best possible experience for every workshop participant. We are honored to work with her and pleased to celebrate Kathy as the Kidpower Featured Coordinator for April/May 2017! From assessing curricular elements to setting up chairs to ensuring every child has an appropriate snack to arranging payment to leading our instructors through a rainstorm in the dark to locate difficult-to-find workshop sites, Kathy has done what it takes to support successful workshops serving classes, staff, parents, and families. 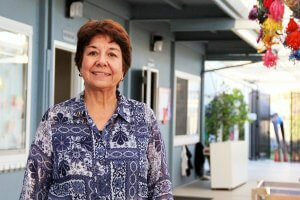 Throughout, she’s been a tireless, focused advocate for OUSD families – and for safety for all. We know that Kathy’s effectiveness in this role reflects passionate commitment and collaboration at many levels within her District – and we all know that Kathy’s willingness to take the lead in organizing a vast array of services from start to finish provided the foundation for success every step of the way. 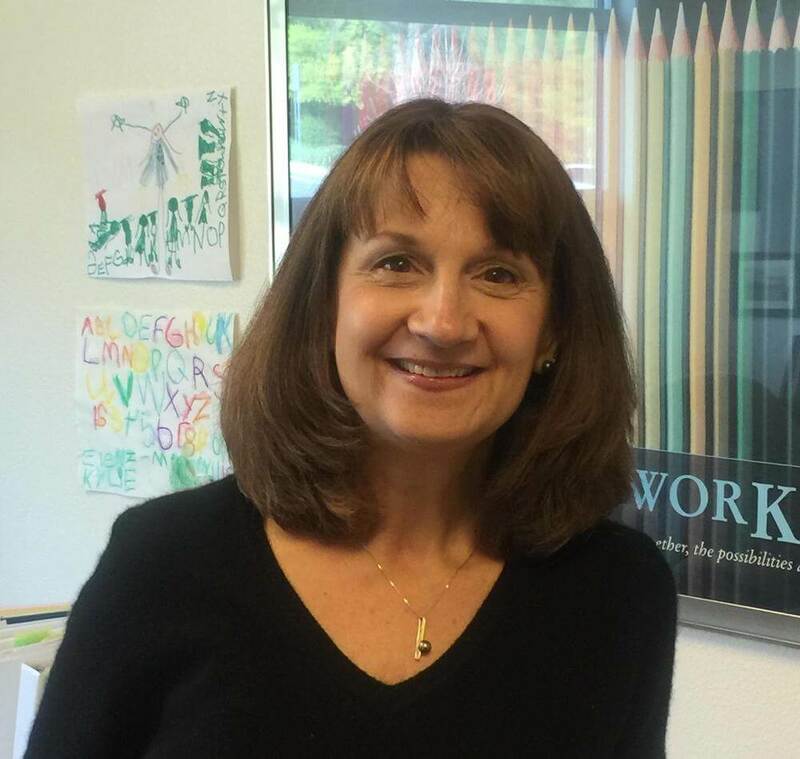 We are grateful to Kathy and to ALL adults in the Orinda Union School District who have invested time in assessing and developing a vision and pathway to ensure a culture of safety and respect for all within the District. We look forward to our continued collaboration! Silvana Mosca-Carreon first reached out to Kidpower more than 15 years ago. As the director of El Nuevo Mundo Children’s Center in Richmond, CA, her first goal was to help her dedicated preschool teachers and staff members build skills to protect their own safety as adults. She knew that teachers who did not feel safe arriving early, staying late, or dealing with challenging situations would leave for other jobs – and she knew that building a safe, confident, committed staff that chose to continue, year after year, would support the best learning environment for kids. Ever since their first Fullpower Adult Safety workshop years ago, Silvana has thrown her doors open wide to welcome Kidpower in all ways! Kidpower’s partnership with El Nuevo Mundo has benefited not just their teachers, parents, and students but also countless others in California and around the world. El Nuevo Mundo teachers were the first to pilot Kidpower’s Spanish teaching books more than a decade ago, and for years, Silvana and her teachers have welcomed a long line of Kidpower Instructor Candidates seeking opportunities to practice teaching Kidpower in Spanish. As a result of Silvana’s advocacy, hundreds of children – mostly from low-income Spanish-speaking families – have learned social safety skills to support safer, more positive experiences with people at school, at home, and in their communities. One of our students, a four-year-old boy, witnessed his father being shot and killed two years ago. Understandably, this child is dealing with lots of trauma that comes out in different ways, and we are working hard to help him be successful. A week ago, this boy started choking another child, also a four-year-old. The child being choked yelled, in Spanish, “Stop! I don’t like that!” exactly as he had practiced in his Kidpower lesson – and it WORKED! The boy instantly let go. I believe that if our children had not had the Kidpower training, these boys would have been fighting, possibly resulting in a great deal of upset for both kids and adults, not to mention injury. 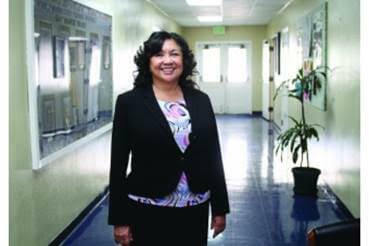 In her role as Superintendent for the Ravenswood City School District in East Palo Alto, Dr. Gloria M. Hernandez-Goff has maintained a commitment to safety and bullying prevention. As a result of Dr. Hernandez-Goff’s commitment over three years to increase access to Kidpower training and resources for teachers, support staff, students, and families in the district, more people within the community have skills for setting boundaries, advocating for themselves and others, and speaking up about safety problems. 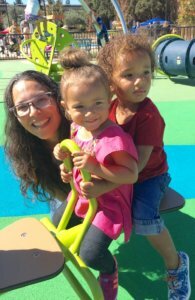 Alexina Rojas, Director of West County First 5 Center, has worked hard to bring a wide range of services and educational opportunities to families with young children in West Contra Costa County. Thanks to her efforts, parents and caregivers of children ages 0-5 have had access over the past three years to learn Kidpower skills and methodology for helping the very young learn age-appropriate social safety skills for safer, more positive experiences with people. Alexina is an energetic advocate for child safety who has taken care to arrange Kidpower services when early childhood educators as well as parents and other adult family members can participate and benefit. Because West County First 5 serves many Spanish-speaking families, Alexina’s Kidpower organizing has reached people that we might not have been able to reach without her leadership. Finally, Alexina has demonstrated incredible respect for Kidpower and the value of the service we provide. While we have directed grant funding donated to Kidpower to help support the workshops Alexina has organized, she has consistently collaborated with other agencies to find funding to apply toward the cost, as well as to extend the reach of the impact of her organized workshops into other East Bay communities. Fiona Hinze takes action to make lives better. 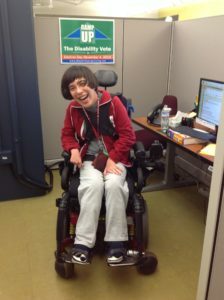 In addition to being the Systems Change Coordinator for the Independent Living Resource Center in San Francisco, serving on the State Independent Living Council, and being an active member of the Disability Organizing Network, Fiona’s efforts as a Kidpower organizer have helped bring safety skills to many people of all ages and abilities in San Francisco. The Independent Living Resource Center generously donates space for public Kidpower workshops serving families with young children, and as the ILRCSF staff member responsible for coordinating this space donation, Fiona has, along with the ILRCSF team, made Kidpower services more accessible to families with young children in San Francisco. In addition, Fiona has taken the lead in arranging Teenpower services for youth with disabilities and organized Fullpower adult safety workshops benefiting adults of all abilities. We are grateful for Fiona’s commitment to empowering people to take charge of their safety! Young adults with disabilities face a host of challenges but, at the same time, they want what almost everybody wants: friendships, happiness, social and intellectual stimulation, and a sense of purpose. Melissa Mitchell, post-secondary teacher for Santa Clara Unified School District, has dedicated her career to providing solid guidance and mentorship to young adults ages 18 to 22 with intellectual disabilities. She works to help students identify personal goals and pursue them so they may thrive vocationally and socially as independent, self-sufficient members of the community. Melissa has arranged Fullpower workshops adapted for the needs of her adult students since 2012. More than 100 people, including students and the staff who support their learning on an every day basis, have practiced social-emotional and interpersonal skills to support safer, more positive interactions with other people. They have then implemented these valuable skills on the job, at school, at home, online, and out in the community. This is super important information for our population of students. The Kidpower instructor has a wonderful technique and ability to sustain attention and interest, leading to retention and implementation of the material. During the workshops for our young adults the Kidpower instructor successfully involves all students, regardless of their ability level and keeps everyone engaged. I am so thankful that Kidpower continues to help our students learn safety skills that will benefit them for years to come. We are so very lucky. I look forward to continuing our partnership with Kidpower! All of us at Kidpower look forward to our continued partnership with Melissa Mitchell and her Santa Clara Unified post-secondary teaching team as well! Lori Gray is a tireless advocate for the personal safety of people with physical disabilities and visual impairments, who face a high risk of violence and abuse. This risk, and the worry that so often grows from awareness of it, can prevent people from taking full advantage of life’s opportunities and can prevent them from participating and sharing as members of their communities. 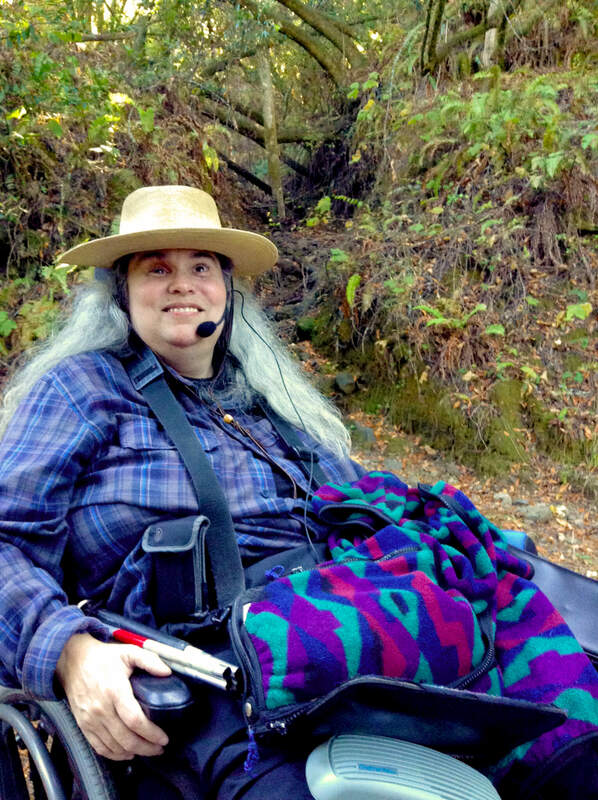 As the Outings and Adventures Program Coordinator for Bay Area Outreach and Recreation Program (BORP) Lori has dedicated extensive time and energy to coordinating Adapted Fullpower Workshops as well as to securing funding to make them happen. Thanks to Lori’s efforts, many more adults with physical disabilities carry skills they can use to take charge of their well-being on public transit, on sidewalks and at community events, and in advocating for themselves and for others. More are free to enjoy their independence and to take in all the best adventures that the Bay Area has to offer because Lori has created these workshop opportunities. 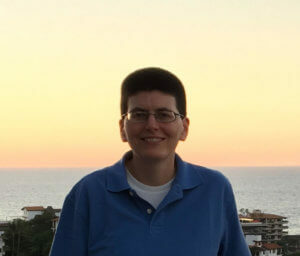 Lori’s personal experiences as a wheelchair user and a blind person have made her uniquely suited to seek out self-defense programs that she knows will serve her participants. 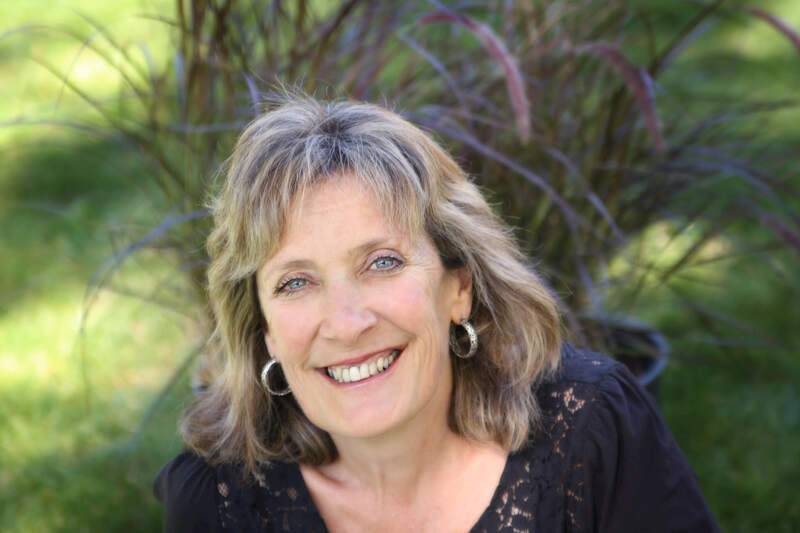 Her passion for her work, combined with her ongoing enthusiasm for the benefits of Kidpower training for people with physical disabilities, make her a joy to work with. Lori always reminds us that the skills we teach ARE immediately useful to people of ALL abilities! 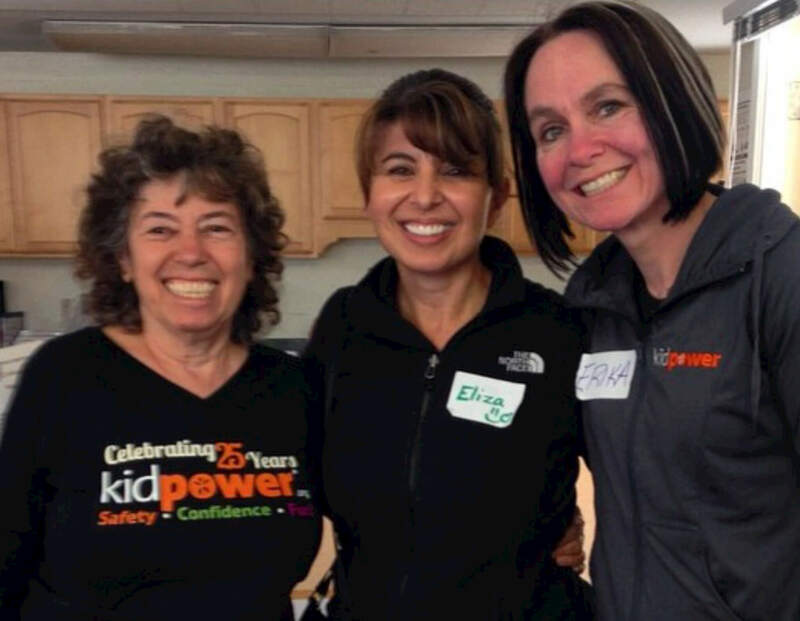 Thanks to the persistent efforts of Eliza Gomez, Early Childhood Education Program Director for the Monterey County Office of Education, hundreds of migrant parents and children have had the opportunity to learn and practice Kidpower skills to be safe from bullying, abuse, and other violence. The Monterey County Office of Education has the largest proportion of students in migrant families in the state, serving nearly 13,000 migrant students in 2014. The County Office of Education offers many programs to help support those students and their families to achieve academic success and contribute to their communities. The School Readiness Family Literacy Program, which Eliza oversees, is a vital part of Migrant Education in Monterey County. Their home visitors travel to homes throughout the county working with preschool-age kids and their siblings, parents and other adults in their homes, building literacy skills in English and Spanish. They also bring families together for Family Literacy Nights at schools and libraries throughout the county, to practice parent and child interactive literacy activities together. Eliza is deeply committed to the safety and well-being of the families the program reaches. Since 2011, Eliza has made Kidpower safety skills a part of their literacy program. As kids and their adults work on early literacy skills, they read about and practice Kidpower skills like throwing away hurting words in the trashcan, and moving out of reach of someone trying to bother you. Eliza’s leadership has brought safety skills to hundreds of families all over Monterey County. Thank you to Eliza for her advocacy on behalf of vulnerable children and families and for her enduring commitment to safety! For 12 years, parents of young children enrolled in Little Wonders have learned Kidpower skills for keeping kids safe without scaring them thanks to the dedication of Mireille McKee, who has worked at Little Wonders for 20 years and has been its director since 2000. Since 2003, Mireille has arranged a Kidpower Parent Workshop focusing on the needs of children ages 0-5 virtually every year. Mireille’s efforts have scattered seeds of safety throughout the San Francisco Bay Area, as Little Wonders parents share their knowledge and bring Kidpower to schools, scout troops, and other groups their families join as the kids grow. As a result, children, teachers, and parents who might not have known about Kidpower get an opportunity to practice age-appropriate, effective, skills for being safe in a way that is FUN, not scary. On behalf of all who have benefited from her efforts, the Kidpower community says THANK YOU, Mireille! Thanks to Jim Blackshear, young adults at the California School for the Blind in Fremont, California, will have stronger skills to protect themselves from harassment and violence, now and for years to come. 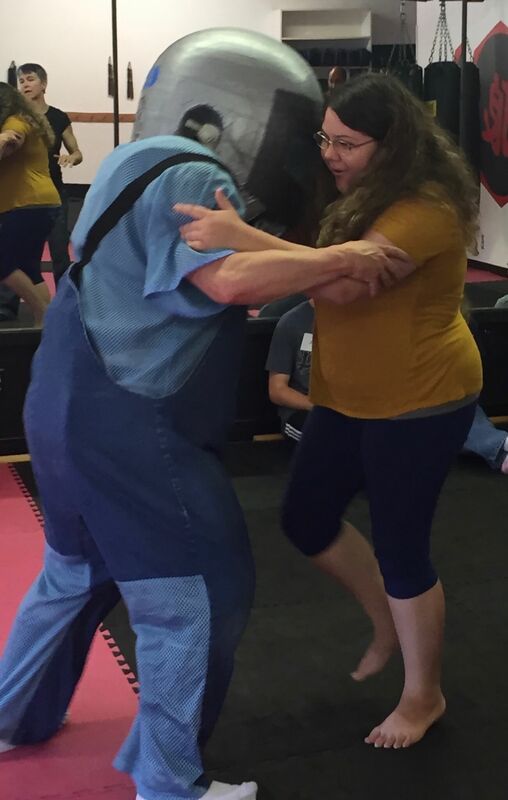 With a goal of ensuring that his students could get hands-on, full force self-defense practice with a head-to-toe padded instructor, Jim actively pursued grant funding. His persistence, perseverance, and tremendous commitment to his students’ safety resulted in him securing a significant grant to provide Fullpower services for his students. We applaud Jim’s efforts and share his commitment to doing all we can to ensure that worry about possible violence does not stop people of any age or ability from living fully! 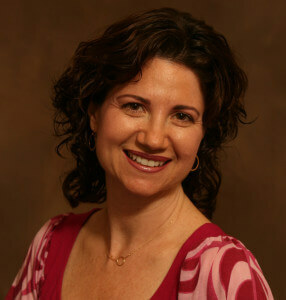 Michal Braker, Director of Education at Congregation Beth Jacob in Redwood City, coordinated her first Kidpower workshop in 2012 for CBJ’s religious school students and teachers. After experiencing the impact of Kidpower training and hearing the positive feedback from parents and teachers as well as from the children, Michal has taken the lead in making Kidpower training a priority by arranging for funding and scheduling of annual workshops. As of December 2014, more than 100 children, parents, and teachers have practiced relevant, age-appropriate skills for safer, more positive experiences with peers, family, strangers, and others everywhere they go, including online, through the six workshops Michal has arranged!